H&P Dog Treats – Just Like Homemade! Our regular readers know that I bake my own organic dog cookies to sell, using ingredients like eggs from our little farm where I can. That might lead you to believe that our Lab mix Luke gets an endless supply of homemade dog treats. However, the truth is, I’m usually cutting it close on my baking, with each of my recipes making just enough to bag up and sell to the three local businesses that are carrying them right now. There might be a few extras, or I might occasionally over-cook them, but there is rarely a lot leftover for Luke. We try to keep Luke slim and trim because of his bad knees, so there is less stress on those joints. Lately, however, we think we’ve let him get a little too slim, so we’ve increased his meals and his treats. With a lot going on, I just don’t have the time to bake extras just for him right now. Therefore, I still need to purchase some. Disclosure: This post is sponsored by H&P Dog Treats; we received the products seen here in exchange for our fair and honest review. 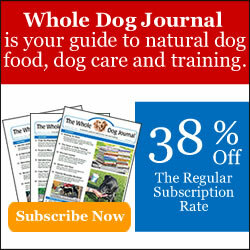 Wag ‘n Woof Pets only shares products we believe will be of interest to our readers, and that we use ourselves. All opinions are our own. It stands to reason that if I use wholesome ingredients for my own homemade treats, that I’m going to be looking for the same when buying treats for Luke. H&P Dog Treats definitely fit that bill (H&P stands for Henry & Penny, two adorable french bulldogs). They started baking their own treats for the same reason I did – wanting to provide healthy treats with quality ingredients and not all the artificial and processed junk so many commercial pet products include. “What’s for breakfast, Momz?” Photo is for dramatization – the oven is not on! They are USDA approved and made in a licensed bakery in the USA. They are all-natural, with no chemicals, preservatives, or artificial colors and flavors. All of those ingredients are also human grade and sourced locally. Each bag is individually heat sealed for maximum freshness, with a shelf life of 1 year (not that anyone’s dog treats last that long, right?). We care about the environment too, so it’s important to us that each bag is BPA free and recyclable. Some of the healthy ingredients they use are: applesauce, bananas, cinnamon, peanut butter, honey, carrots, sweet potatoes, and grain free flours. We actually do make food especially for Tiny her teeth are not as great as they used to be and she is really picky. I haven’t baked for my dog yet but I have thought about it. So far, I have never baked treats for my dog! What a cool batch of treats and a cool company. Luke scored well here. Even when I can’t do homemade, I try to pick treats he’ll love! I’m not much of a cooker, so I don’t bake for my pups. I do, however, grill them venison burgers often. They love those! Thanks for the chance! I’m pretty sure any dog would think that was just as good – even better!! My beagle likes everything except lettuce. That won’t be a problem, will it? I don’t think so! 🙂 My beagles were pretty picky, and wouldn’t eat most fruits or vegetables. But they never turned down a baked treat! I rarely bake treats for the dogs. It’s not because I don’t want to, but with two walks a day, plus full-time working, I just don’t have the time. I’m grateful for people who do, and who bake nice treats I’m comfortable giving to my dogs. I agree. It is so hard to find time to do everything we’d like to, so it’s great to know others will help us out and we can still feel good about what we’re giving them. I do not bake dog treats (or anything at all, for that matter!) My dog would LOVE these treats! No I have never baked any dog treats but they really like my peanut butter cookies. I’m sure they have no complaints about that! Thank goodness there are others out there who can do the things we can’t. I can’t sew to save my life, so what if I didn’t have others to make clothes for us? We’d be in sackcloths around here. LOL! Hahaha. We surprised you waiting so long, Luke! I am drooling all over da keyboard looking at all dat yummy goodness!! You need some of these, Matt!! Those treats sound tasty enough that the mom might eat them! Oh, they smell good too. I’m sure tempted to try one! I can certainly understand that!! Yummy! Looks and sound very tasty!! I hope I win this giveaway. I really want to win. What a nice giveaway. I make biscuits for my 3 dogs occasionally. They aren’t too hard to make, and they love them. those look delicious and thanks for the chance to win some! Love the names of the treats! Nope I do NOT bake dog treats! You’re very welcome – good luck!! You’ve sure found a bunch of yummy one Luke, they do sound great! Be careful! They smell so good, your mom might try to eat them! Enjoy! I wouldn’t put it past her!! oh they are really like home made (not by our mama, her art pieces look different… very different) dig in Luke and eat them all including the last morsel.